left the Emerald Isle and is now resident in the USA and Australia, nearly all the Old IRA medals have gone that way over the last 6+ years or so. 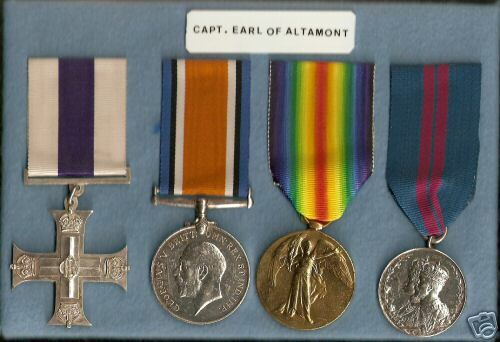 Military Cross, G.V.R., reverse inscribed "Earl of Altamont"; British War & Victory Medals "Lieut. Earl of Altamont"; Coronation Medal 1911 inscribed "Ulick de Burgh, Viscount Westport" contact marks, otherwise GVF. Naming on Coronation medal worn on left edge. HE MIGHT ALSO BE ENTITLED TO AN IRISH EMERGENCY SERVICE MEDAL as a MEMBER of THE LOCAL SECURITY FORCE (see below) This has not been researched. He was aged 13 when he received the Coronation Medal in 1911 as Viscount Westport and was just 20 years old when he won his Military Cross as a Cavalry Officer for mounted actions over a four day period. The Official Citation for this Cavalry Military Cross reads "Lt. Ulick de Burgh, Earl of Altamont, 2nd Dgns., For conspicious gallantry and initiative when on reconnaissance at Vieville and Fesnoy on 4th November 1918; near Le Sart on 5th November and South of Cartignies on 6th and 7th November. During these four days he handled his patrols with great skill and boldness , obtaining and sending in accurate information." ex London Gazette 10 December 1919 p,15314. He was born in 1898 and died in 1941 - see obit attached from the Irish Times 8th January 1941 which reads..."We regret to announce the death which took place after a short illness in a Dublin nursing home yesterday evening of Ulick de Burgh Browne, seventh Marquess of Sligo , of Westport House, Co. Mayo. The Marquess of Sligo who was born in 1898 was educated at Eton and at The Royal Military College Sandhurst, being commissioned in the 2nd Dragoons , Royal Scots Greys . He served during the European War of 1914-18 with the rank of Captain and was awarded The Military Cross. After retiring from the Army he settled down at Westport House and took a considerable interest in local affairs. Since the outbreak of the present war (WW2) he has established a first aid station, with three wards, at Westport House, and has provided a fully equiped fire engine and an ambulance for use in the district.He also joined The Local Security Force and was a Group Leader in Section B. The Marquess who succeded his father in 1935 was unmarried. He is survided by his mother (The Widow of the Sixth Marquess) and is succeeded by his Uncle Colonel Lord Arthur Browne K.B.E., C.B.,who was born in 1867. The Scots Greys were immortalised in Lady Butler's paining of their famous charge in the Crimea. Ulick de Burgh Browne, 7th Marquess of Sligo was born on 30 March 1898. He was the son of George Ulick Browne, 6th Marquess of Sligo and Agatha Stewart Hodgson. He died on 7 January 1941 at age 42, unmarried. 1. [s21] L. G. Pine, The New Extinct Peerage 1884-1971: Containing Extinct, Abeyant, Dormant and Suspended Peerages With Genealogies and Arms (London, U.K.: Heraldry Today, 1972), page 72. Hereinafter cited as The New Extinct Peerage. This is a very late Great War Cavalry Gallantry Group (when Cavalry rode horses) of attributable Medals to a member of one of the most famous and distinguished titled "Irish Landed Gentry" Families. Worthy of further research. Another example of the fine fighting and gallant actions of the Irish Soldier. See also http://en.wikipedia.org/wiki/Marquess_of_Sligo for more background information on the family of the Marquess of Sligo. PS: The family still have Westport House and have a long connection to the Irish Military tradition going back to the South Mayo Militia which became the South Mayo Rifles, which in turn became a Militia Bn of the Connaught Rangers, which was disbanded after the Mutiny of the Connaughts in 1920. Following along with the Darwinian theme, maybe it is a case of monkey see, monkey do. In recent years an established Dublin auction house disposed of the medals of a certain Kathleen Clarke in a similar fashion. At whatever level it is an outrageous and disgraceful travesty. By the way the Fullam group (Whytes 2006), similar in many respects to Tynan, survives intact. the Dail takes forever to do things like proclaim its the official day of recognition for some deserving species of finch; they'd take years before outlawing transfer of Eire medals...if ever. No, the press could shame this jerk into keeping it together or maybe even depositing it with the National Museum. It makes a good story-tales of greed and the dissipations of modern wealth are popular topics. Here it would maybe do some good-we are talking about the destruction of history after all (and all the entails). Hello, this is my first post on this forum but given the topic I couldn't resist in posting. I viewed the Tynan lot at Whytes and have to say that it was the finest and most complete collection that I have yet come across. It had everything in it, and told one Volunteer stories from the formation of the Volunteers in 1914 (his 1914 dated IV membership card currently on ebay) to the civil war (the 1923 dated internment order signed by Richard Mulcahy, which was sold in the original "cull" on ebay a couple of weeks ago). I have seen many other 1916 medal groups both for sale and in private collections but not one matched the Tynan collection. In my opinion it merited serious study and while I agree with the principle of private property and a persons right to dispose of their property as they best see fit, at the very least this collection should have been documented and recorded. All of the letters should have been transcribed and copied, and everything photographed and recorded. What actually happened was that the original group of 16 items went on ebay shortly after they were bought and when the rest of the items didn't sell as a group they have now been offered for sale individually. In my opinion splitting the paperwork group was just as much, if not more, of a "historical" crime as splitting the medal group. The groups of prison letters, firstly as a Republican prisoner during the War of Independence, and later as a Republican prisoner during the Civil War were a near unique collection. Along with the rest of the collection they told an individuals story, pretty much from start to finish (depending on your own point of view!). Again from my own opinion and speaking from a strictly business point of view; I was at the Whytes auction and gave the Tynan group a shot, I wasn't the under bidder but I wasn't far off and at 25,000 Euro plus fees I though that the collection sold for what it was worth. If I wanted to invest 30,000 Euro in something that I didn't have any great interest in and wanted a quick get out then I'd be looking for a much higher return then it appears the seller is going to achieve with this group. To finish up I'd also like to point out that Whytes auction house themselves split Tynan's group into two, the collection that sold for 25k and another lot of mainly paperwork from the 1930's/40s that also came from the Tynan family. Yes . . . . . . . . . how long can the skull stand up?? No problem Ed, as I mentioned I haven't posted here before but I just couldn't but add my "two cents" on this topic. On any level what happened to this group doesn't make sense to me. If your going to invest 30k in something and want out in a couple of weeks, a return of a few % on your investment doesn't appear all that attractive to me. Also your buying something that a few years ago was worth a fraction of the amount involved, will the market go down? Prices have been rising steeply in Republican militaria in the past few years but when the Tynan medal group only makes ?10,000 on ebay, is that a sign that the market has peaked, who knows? As a collector I was willing to pay there or there abouts for the Tynan group to own and research it, I wasn't interested in it on a cash value basis. If I had bought it at the auction, I may well have sold a lesser 1916 group from my own collection to finance it, but it would have been kept together. I had a similar "problem" earlier this year when I bought the Walker collection; http://www.adams.ie/BidCat/detail.asp?Sale...&LotRef=435 . A couple of weeks later his armband appeared on ebay. Adams had not included it with the medals and left it in the display case. A dealer bought it (incidentially the same one thats currently selling Tynans medals) just after the sale when Adams returned it to the family, and listed it on ebay. At the time I chased it up to ?4,000 and ended up as the under-bidder, not because I though that a 1916 armband is worth that kind of money but because it was Walkers, and I wanted to reunite it with his medal group. At ?4,000 I had to bow out but at least I gave it a shot. I agree totally with Ed Haynes, Ulsterman and Molders that the only way to achieve this is to name and shame the person responsible in the media. I think the public pressure might ensure it is kept as a single collection and maybe if it is media highlighted the National Museum would purchase it. It's still a real shame what is happening. The so called 'celtic tiger' has a lot to answer for, when an idiot who has that kind of cash to spare thinks he can make some fast profit by splitting the group and selling it off... on EBAY for gods sake!... It just shows the level of his intelligence. Well put, Danny. You need help? Shall fly trans-Atlantic to join in. I think the seller was trying to exploit the 'major' players by buying the medals at Whytes auctions then selling on ebay. I guess he thought they would come back in again and bid higher than they did at Whytes, how wrong could he have been! The 'major' players haven't taken the bait and the medals don't sell, he is left with medals that cost him over the odds. I hope no other member of this forum bids especially knowing the circumstances. He paid roughtly ?30,000 including auctioneers fees, taxes etc, he will be lucky to recoup half that amount judging by the poor bidding on his items currently listed. What should (or could) happen now? Should one or more of the "major players" purchase as much as possible and unite it, at top ebay prices? I think some items from his initial ebay cull (sold without reserves) are united already. Or would this just encourage and reward him? If he profits he may do it again and again at each auction. The 1916 with its start of 6,000 sterling may not get a bid if the so called "major players "decide to stay away. But the other smaller items will all sell as they have low start prices and will end up all over the place. Or is it all too late now for this great collection. Good point-if he does this and makes a profit, then it'll be incentive to do it again-and again-and again. Who is the seller anyway? there is no more lasting and effective "message" than boycotting this ghoul. Let him lose his house and sleep under bridges. Let his hungry children wander the streets, begging. Let him become the ghastly example of MINDLESS greed-gone-wrong in pub stories by generations of collectors yet unborn. In reply to Irish1916, yes it does beg the question - is the Irish medal market well over inflated? If the 3 or 4 major collectors (ALL decent, honest and honourable people i might add) didn't compete against each other perhaps the medals worth not be worth the prices they are now achieving? In the longer term those medals that cost so much at auction still be worth it? they could only be sold to a very small handful of people able to afford it. We might well be dedicated collectors with the right intentions of keeping the medals, but what about the following generation? will our kids really appreciate them or try to sell them when we are all gone? If someone today does pay ?10,000 for a 1916 medal, in years to come who can they sell it onto? who can their kids sell it onto if they don't want to keep our collections? not many as again no-one could afford it. I think if a 1916 medal came onto the marketplace and the 3 or 4 major collectors didn't bid we would see the real value of such medals...would be interesting! Have any of the newspapers picked up on the ebay seller yet??? Within this post there are a number of serious collectors of Irish medals, myself included. The group is well worth the price it fetched at Whyte's auction and I had considered bidding on it. However I already have a number of other comparable groups in my collection and have just purchased a house and new car this year so I could not justify the extravagance to myself (ok, to my wife!). I personally know more than four serius collectors of 1916 medals who would have been interested in this group so I beleive the collecting market out there is much bigger. What you must recall is that ebay has a poor reputation for fakes and cobbled together items so some avoid it altogether for good stuff and the Whyte's auction was an auction of Irish art with a few medal lots stuck in the middle of it. Hence, I suspect a lot of collectors missed it. Within this post there are a number of serious collectors of Irish medals, myself included. The group is well worth the price it fetched at Whyte's auction and I had considered bidding on it. Do you really think the Tynan collection was worth ?30,000??? 5 years ago what could we have bought it for, ?5K - ?6K. I think the medal market has been pushed too high because a small handful of collectors (me included) that have bidded against each other and perhaps falsely inflated the prices. How many can afford ?30,000??? only a small handful of perhaps 5 collectors. My point is that without that small group of collectors the Irish medals would not have rocketed in value so much simply because we bid against each other. It is also sad as now not everyone can afford a 1916 medal. The Whyte's auction was an auction of Irish art with a few medal lots stuck in the middle of it. Hence, I suspect a lot of collectors missed it. As someone who has been involved in the bidding on some recent medal group sales I agree fully with the last couple of posts. I think that the top end of the Irish medal market has now reached a stage where 5 or 6 people compete against each other time after time, driving prices ever higher. I don't think that we'll ever return to the days of ?50 Comracs or ?200 1916 medals but we are now at a point where ordinary 1916 medals with no history or background are achieving prices of several thousand euro. I just can't see the logic in it at all. When compared to other areas of militaria, that amount of money would buy you a German WW2 Knights Cross with paperwork etc, a top end British gallantry award medal group, uniform collections, presentation swords etc. and those type of items are collected by a much larger group of collectors worldwide. Just think of how many Third Reich collectors that you meet at shows, auctions etc compared to the amount of people who can honestly say that they now actively collect 1916 related items. We are in a serious minority and yet we seem to be beating each other up at auction all the time. I don't know what the solution is, thats the beauty of the free market, but with regard to the present situation I for one certainly won't be going next to near Tynans 1916 medal on ebay. If I did every thime I looked at it I'd be reminded of the rest of his collection that has been scattered, and remember that if this guy makes a profit on the Tynan collection, he'll be encouraged to do this again. Having striped all of the history away from it what is his 1916 medal worth on its own? We have witnessed a prime example in the Tynan debacle of someone indicating knowledge of the price of everything and the value of nothing. A real display of avarice without borders. The Tynan group beyond argument is worth more historically and monetarily than its constituent parts. Without the confirming documentary framework the individual medals/medal group are reduced to a naked state. It would seem from the debate that we have a valuation issue. Where have all the Service Medals (1916 -1921) gone ?? Rank 1 - 1916 named award to Executed Leaders & others. So, value is at times in the eye of the beholder, and in the case of Tynan, I do not believe an excessive value was established through the actions of a few bidders. In fact, relative to the excesses of the full on Celtic economy I would consider the pricing to be about fair value. In closing, I am happy to advise that all the important Tynan documentation from the ?first ebay cull? has been acquired for research by a well known period collector. Regret to advise that the scattering of the Tynan medal group has begun - the 1966 commerative has been disposed of privately !!! is now up to: ?1.320,00. An officially named and numbered 1916 medal (higher than the 80's and thus not Easter week killed in action) changed hands at over 10,000 sterling today. The details of the purchaser as told to me by the family member selling the medal would indicate he is neither one of the "major" players nor even a member of the contributors or readers know to me in this thread. Did you get details of the name and number ? Yes, but I don?t want to publish them in fairness to the purchaser, email through my web site if you want to discuss this further.